Armed with a willful disregard for all the usual musical trappings, Mahlon Hoard�s and Slicnaton�s combination of ambient and free jazz musings set out to dissolve the boundary between music and environmental noise. Relatively organic in its instrumentation � led by saxophones and synth background layers � Slicnaton is a tease of sounds and ideas combined in a surreal 40-minute experience. Briefly treading into a darker and somewhat mechanical area, the album suffers in its first half from a frustrating tendency towards noodling, with many of its ideas seemingly unanchored and out of focus. Instead of tickling the ears with tonal colours and layers so typical of ambient music, Slicnaton borders on making them bleed. �Clown� and �Operator� travel from eerie masked strings and synths into contagious sax drones reminiscent of a bad cold (blocked nasal passage sounds included). If you can get through the first six disorienting tracks, it�s nice to hear that the best tracks come in the second half. Coalescing the wandering tones and melodic ideas into something more solidly musical, the lush and mysterious synth textures of �Not A Clue� transforms into a coherent, yet free-spirited, drum break and synth line with touching effect. The sudden shift in musical direction offers tracks like �Is She� as an example of how good slow atmospheric breaks can be infused with smooth, muted sax bleeps arrayed against a backdrop of ghostly chords that seem to hang suspended in mid air. The playful quality of Hoard and Slicnaton�s sonic curiosity is best expressed with the tracks �Iff� and �Hey Sarah.� �Iff�s� descending piano runs sound like drops of rain scattering across the sidewalk, while �Hey Sarah� sounds like the weather has turned for the worse, as freezing rain pellets create a percussive symphony. �Whorgan� is perhaps the most strikingly different song on the album, combining a snaking sax run here, a Hammond organ there, and some synthy reversed sounds moving in the background. It hovers on the edge of perception, allowing your attention to dip in and out as you please. Throwing the musical boundaries out the door is not a bad thing; in fact, it�s a lot of fun to do. Hoard has had the amazing opportunity to work with Adam Holzman who is renowned for his MIDI and synthesizer programming skills (not to mention, member of Miles Davis�s band in 1985). 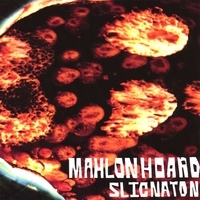 Slicnaton � who is in charge of the synth bits � has his M.A. from the Berklee College of Music. So right there is an indication of extreme talent. Unfortunately, this direction doesn�t work for them. It�s good to say they tried on the ambient and free jazz act, learned a thing or two, but Slicnaton feels more like a testing ground than anything coherently close to an album.